The Museum of Science Fiction believes that science fiction is rich with ideas that can serve as a springboard for curiosity and project-based learning activities. Based on the belief that science fiction holds educational value for all ages, the Museum and its partner organizations endeavor to develop and tailor our educational competitions to appeal to a wide variety of students, as well as the general public. 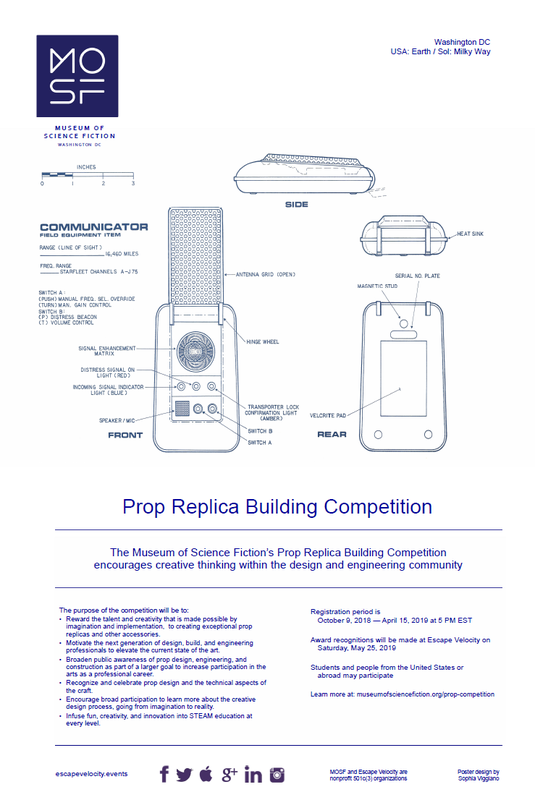 As a celebration of the importance of prop replica design and construction, the Museum of Science Fiction is holding a prop replica competition. This competition is open to all students, designers, engineers, builders, and artists. People from the United States or abroad may enter the competition. The Museum of Science Fiction is a 501c(3) nonprofit organization that seeks to make a measurable positive impact on STEAM-related educational activities. The Museum of Science Fiction believes that prop replica design, engineering, and construction is one of the most important interdisciplinary art forms of science fiction. The craft of prop replica design and construction dissolves the false dichotomy between the arts and sciences. Builders use many different innovative techniques and technologies to engineer props and wearable art. The art and craft that are involved in prop replica design and construction bring an aspect of expression that uses analysis, planning, engineering, drafting, and other critical building skill sets that are also found in the sciences, arts, and other real-world professions. The competition will showcase the best prop replica designs across all aspects of science fiction. Reward the talent and creativity that is made possible by imagination and implementation, to creating exceptional prop designs, design engineering design construction, and other accessories. Motivate the next generation of design and engineering professionals to elevate the current state of the art. Broaden public awareness of prop design as part of a larger goal to increase participation in the arts as a professional career. Recognize and celebrate prop design and the technical aspects of the craft. Encourage broad participation to learn more about the creative design process going from imagination to reality. Infuse fun, creativity, and innovation into STEAM education at every level. The competition will notify finalists who will be invited to present their design implementations at Escape Velocity 2019. Prizes will only be awarded to the finalists. All finalists will receive two Weekend Passes to Escape Velocity 2019. The competition registration period will be open from October 9, 2018 to April 15, 2019. Judging will be held on Friday, May 24, 2019 at Escape Velocity with the award ceremony on Saturday evening, May 25, 2019. Masters - This class includes all professional and non-professional builders. Entrants are free to submit their work in either the Original Content or Prop Replica categories. Young Adult/High School - This class can include both the Original Content and Prop Replica categories, but will be restricted to persons of high school age or younger. Participants younger than 13 years old must submit a parental approval form with their registration. For the Prop Replica category, the criteria follows an aspect of "how close" the implementation comes to the designs as chosen. Elements of accuracy and authenticity will be determined from a variety of sources that have been determined to be reference authorities. Prop designs must be related in some way to, or invoke, science fiction. Entries may be of any physical size. Competitors will submit a high resolution jpeg or pdf file illustrating their design. Competitors should include detailed, illustrated concepts. Prop illustrations, photographs and details shall be submitted as a package. Image files should be in jpeg or pdf format, with a minimum resolution of 300 dpi. Proof of original work may be required for the technical evaluations at Escape Velocity in the form of in progress images. Keeping a work log is recommended. Winners may also be asked to lend their work for display by the Museum for a period of up to 12 months. The competition will be in two parts, Finalists will be selected first. The second part will be a technical implementation evaluation of the design, with the expectation is that the design will be built or has been built to the design submitted. Competitors are expected to physically present their designs at Escape Velocity for final judging. For award eligibility, finalists must be present and show their work at the final judging at Escape Velocity, on Friday, May 24, 2019. Competitors presenting work that is not their own will be disqualified. No projectiles, metal blades, pyrotechnics, or functional firearms. Designs may be submitted in a combination of two formats. One being standard JPG image file format with no less than 300dpi per image. PDF format may also be used, we ask that a combination of JPG and PDF files may also be submitted. To receive a registration number, you must complete the registration form below. Thanks for your interest in the Museum of Science Fiction International Prop Replica Competition. Your registration number will be sent to you soon. The competition registration and submission period will be open from October 9, 2018 to April 15, 2019 at 5 PM EST. After completing the registration form, a number will be assigned to you and must be included with all submission materials. Finalists will be notified on or about April 30, 2019 and will compete in a final round of judging on Friday, May 24, 2019 at Escape Velocity. An award ceremony will be held at Escape Velocity in Washington, DC on Saturday evening, May 25, 2019. Awards will be made at Escape Velocity 2019 on Saturday evening, May 25, 2019 in Washington, DC. anytime before the registration and submission deadline on April 15, 2019 at 5 PM EST. Parental Consent Form: Click to download (if you are under 13 years old).